If you have dry skin, you know that soothing, constant hydration is a key part of your skincare routine. But what about makeup for dry skin? Finding the right products can be difficult, since dry skin is often accompanied by flaky patches that makeup only magnifies. Not to worry, though; we have must-know tips to help you achieve the dewy skin you want. 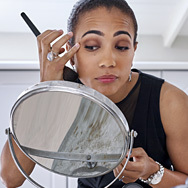 You may already know this, but it bears repeating: What you apply to your skin before you put on your makeup can play a big role in how that makeup looks throughout the day. The best way to set your skin up for success is to use a skincare routine that treats your dry skin to healthy hydration from a robust mix of beneficial ingredients. This way, you’ll plump up skin so it appears smoother and more radiant, with or without makeup. Stubborn dry patches? An antioxidant-rich blend of non-fragrant plant oils will turn that around overnight so your makeup goes on beautifully in the morning. A great moisturizer with SPF is also critical, as sun damage can lead to increased dryness. The right daytime moisturizer can also serve as a primer, creating a supple canvas for foundation. One more secret: Exfoliation with a leave-on product is key to younger-looking, smoother, more vibrant and hydrated skin. If you haven’t tried such a product, prepare to be wowed. For dry skin, an alpha hydroxy acid (AHA) lotion applied at night after cleansing, but before moisturizing, can work wonders on dry, flaky skin. Dry skin can often appear dull, so avoid matte, powdery finishes, which can emphasize dullness and areas of very dry, rough-textured skin. Dewy or glowy finishes can add much-needed radiance in an instant. Creamy blushes and highlighters are also your friend; in a way, people with dry skin are lucky in this regard. Cream formulas have much better staying power on drier skin, whereas on oily or combination skin, they can slide off or fade midway through the day. Stay away from makeup products containing SD or denatured alcohol, witch hazel, essential oils, or fragrance. These ingredients are bad for all skin types, but in the case of dry skin the irritation they can cause steadily saps dry skin of what little hydration it has. What if you want to finish your look with powder to make sure it lasts into the wee hours? People with dry skin can use a setting powder, but keep in mind: You don’t need to powder your entire face. Just brush on a light dusting over the areas that show a little oiliness (most people experience some shine on their nose) and leave the cheeks powder-free. When it comes time to take off your makeup, what you use is important as well: Avoid makeup removers that have harsh, irritating ingredients (which again, can lead to irritation and more dryness). Instead, reach for a super-gentle formula that takes off even the most stubborn formulas but doesn’t strip skin of its moisture! You can also take advantage of the skin-softening and makeup-removing benefits of a gentle cleansing oil. Learn more about dry skin.